This year we take the pressure off buying for the cycling tragic in your life. We've searched high and low to come up with the definitive list of Christmas gifts and there's not a hint of lycra in sight. 1. Cadel Evans "The Art of Cycling"
Published just in time for Xmas is this great holiday read by Cadel. A four time Olympian and the only Australian to don the yellow jersey in the Tour de France, Cadel writes about the triumphs, the frustrations, the training, the controversies and, above all, his enduring love of cycling. Cycology's range of cool retro t-shirts are just the thing to slip on between rides. Best of all much of their stock is currently on sale! > check them out here. 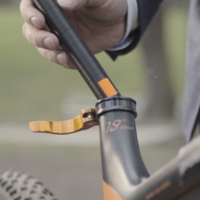 Protect your bike from theft with a GPS positioning system. This one from Troja Bike can't be turned off or removed, fits securely inside the bicycle frame, and is tracked via a mobile app. Rated as one of the better commuter e-bikes on the market. Ideal for road riding but can also be kitted out for off-road. Fully customisable with a variety of frame, battery and motor combinations. Like the Ford T, only available in fashionable matt black. What Christmas is complete without at least one pair of socks. These 'dazed donut' socks from DeFeet are made from the fibre that comes from recycled plastic bottles. Not only are they good for the planet they're very comfortable. The author has no vested interest in the companies and products represented in this article.